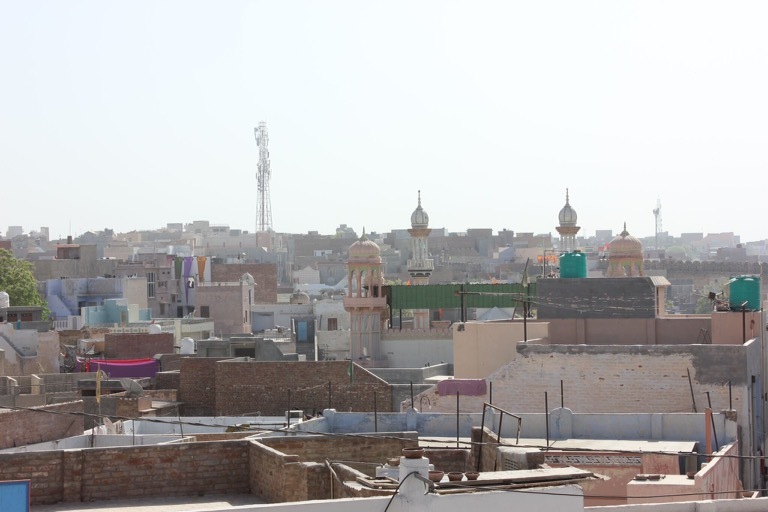 Soon enough we were in Bikaner, another important stop on the caravan trade routes until India and Pakistan became seperate during independence in 1947 and left this area behind. Our newest guide had great pride of his hometown, declaring it more beautiful and ornate than anything we had seen before. 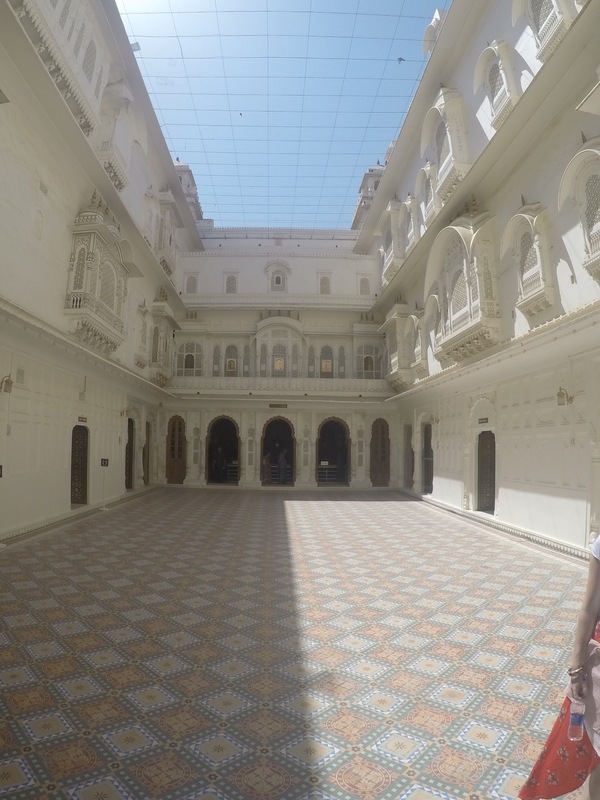 The Bikaner fort, another royal residence, was evidence of the 24 maharajas of the area. 16 had contributed to this magnificent structure, each adding a room in their own style. Dad amused us by dubiously asking the guide how the 24 maharajas all fitted, not realising they were ruling one at a time. 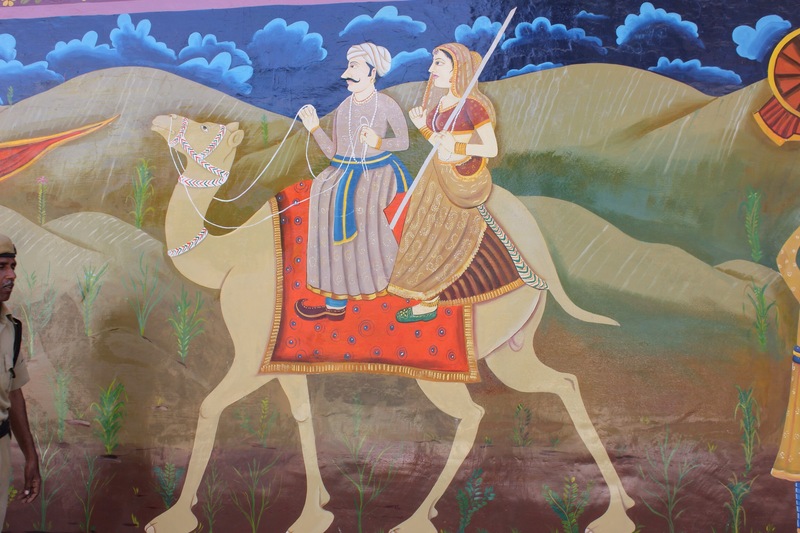 ﻿ Bikaner had another thing going for it, camels! As a gateway to the desert they had an abundance of them. 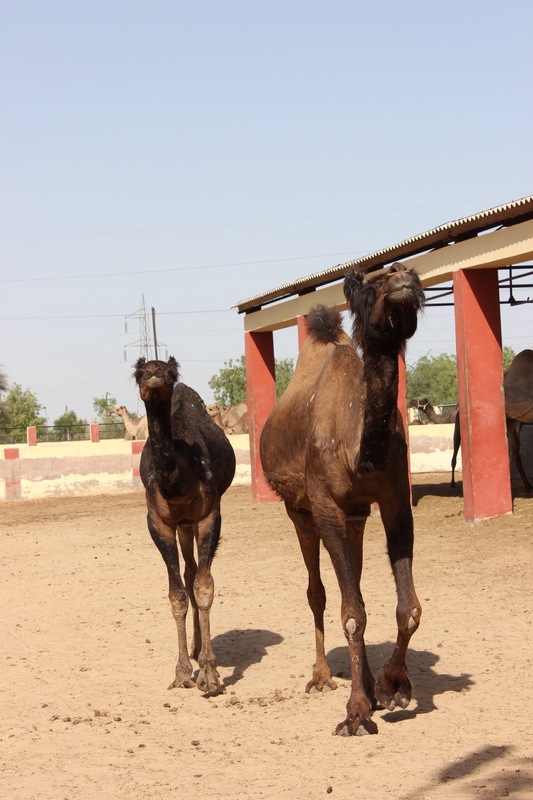 We were taken to a Camel farm and research centre where they looked after and monitored them through their 13 month pregnancy, studied cross breeding between the four local types and also milked them. 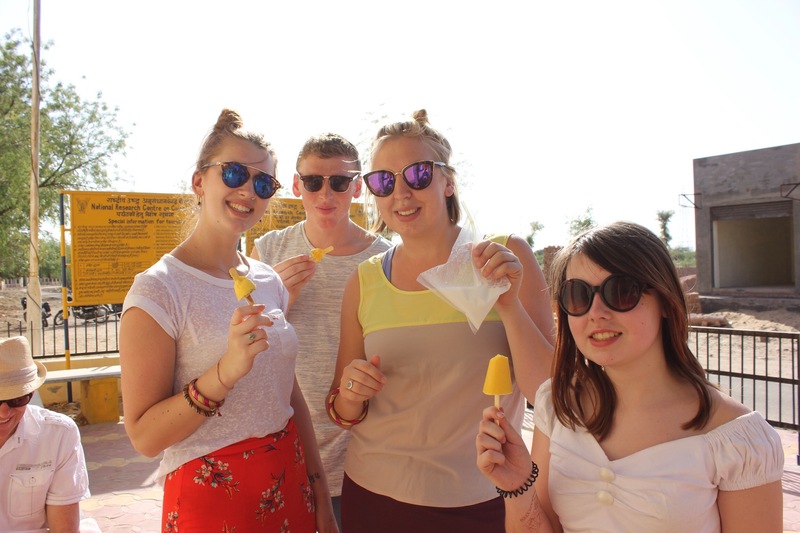 We tried Camel milk and kulfi (ice cream) and were pleasantly surprised! 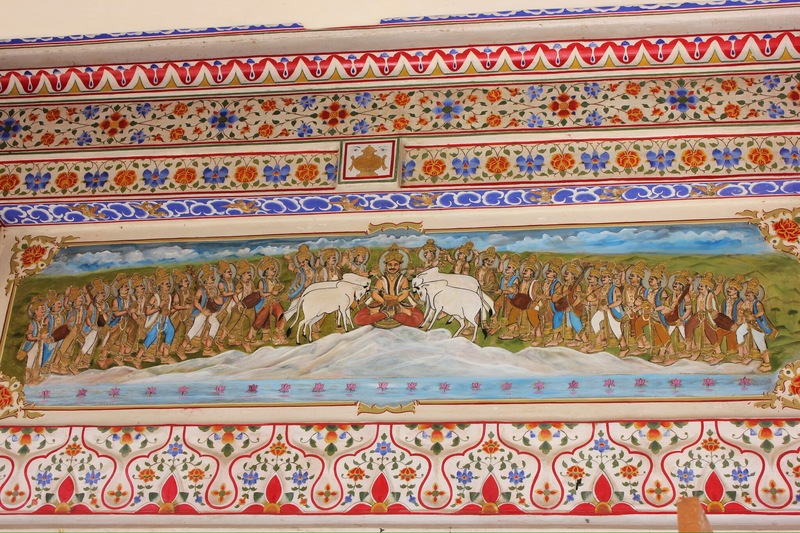 Famed through the decoration in the fort, Bikaner has become famed for miniature art. We went to see Guiness record holder artist at the studio where he welcomed us in to show his talent and works. With a microscope you can see in his paintings every single hair, every line of shading on the face, and he did it all without microscope or aid. The same art he could do on smaller and smaller areas, his record breaking piece 5cm x 3.5cm with 70 plants, 30 animals and 1200 leaves. 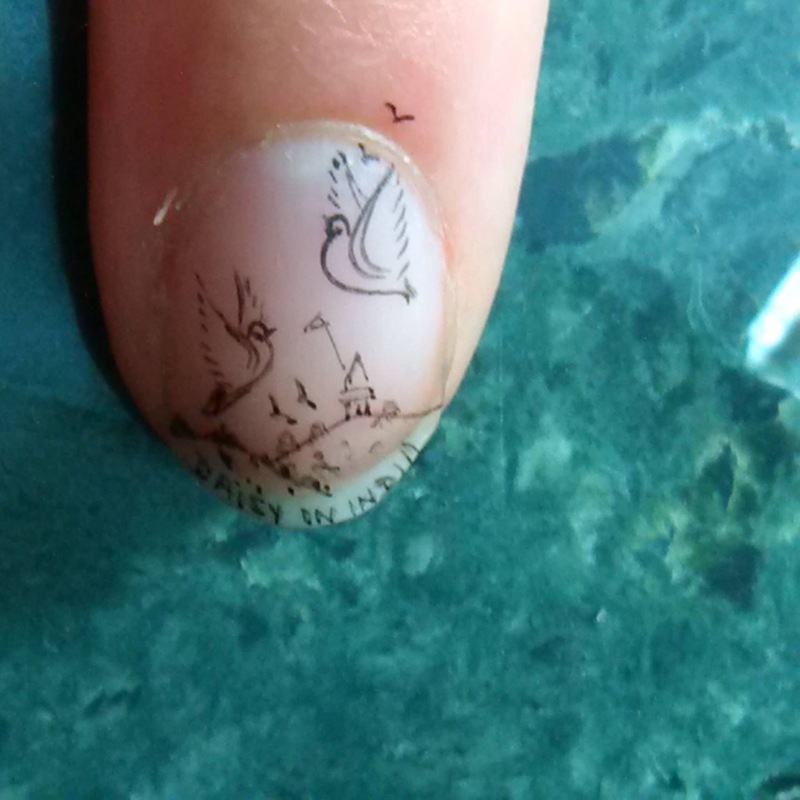 He did an improvised piece on Daisy’s fingernail with six birds, a temple on the hill and text. We rounded off another beautiful Indian day with a meal at a rooftop restaurant, now experimenting with the different flavours and learning our regional favourites. The largely vegetarian menu offered lots of different options of paneer cheeses and beautiful vegetables. 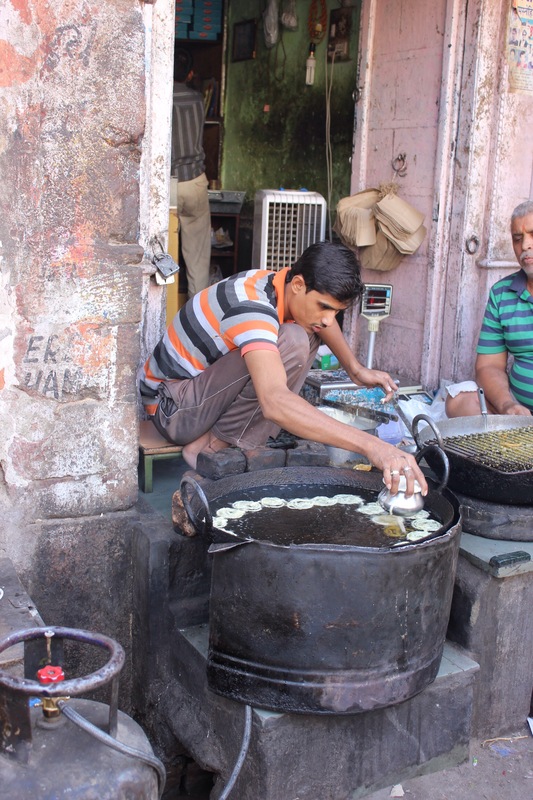 Jeera Aloo, a potato with cumin seeds was a popular staple and it was fun to try snack foods such as Pande purey and kulfi. 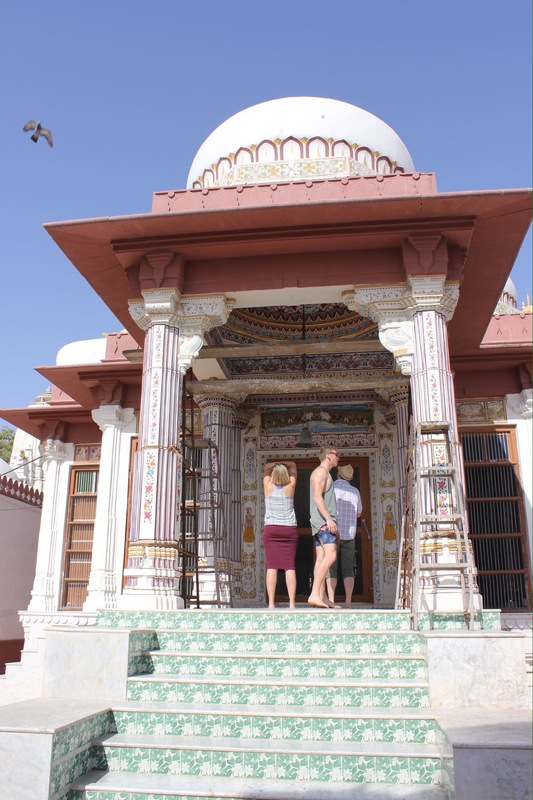 In the morning we were collected by Tuk Tuk to go to Old Bikaner. Our convoy got caught behind the dividing goods train and with motorbikes, cars and cows we sat watching a huge load of freight moving through. 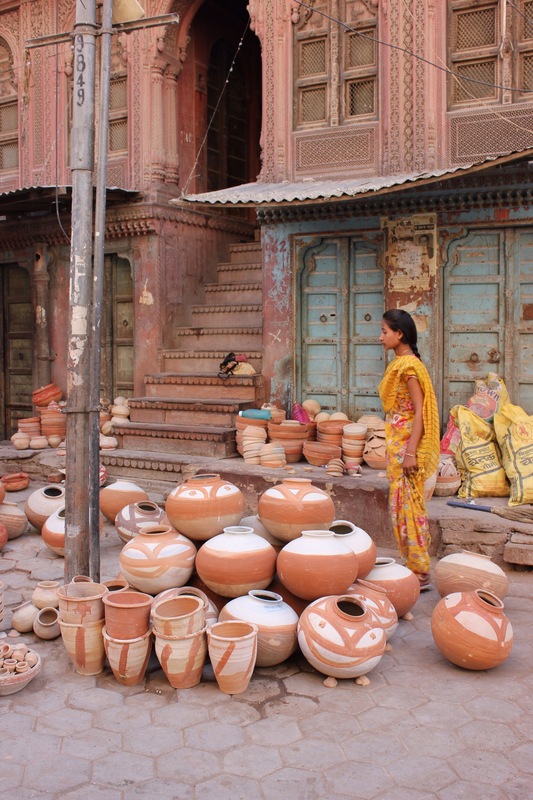 The old town was filled with more merchant havelis, more intricate even than the work on the palace. Some were relatively recent, some 500 years old, all carved in amazing detail. At street level cows and goats did their own thing, traders began to set up slowly filling the market place with goods. We watched mesmerised as a man deep fried battered donuts, carefully crafting each swirl through a hole in the bottom of his metal cask. Vendor spots even have a vast heritage passed down through the generations. 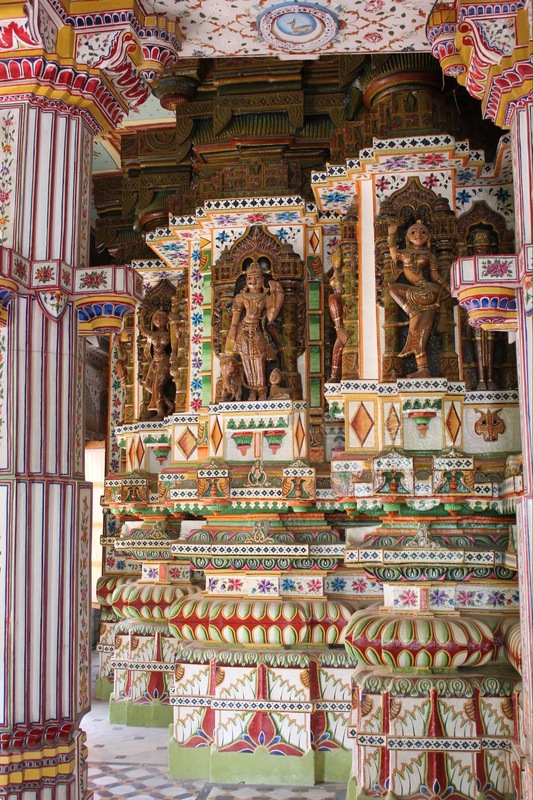 An incredible icon was the highly ornate Jain temple carved from one single stone. The creation and artwork meant it took 44 years to create and predated the town. From the temple balcony you could see into the simple village, women dying cloths and creating goods for sale in the town. 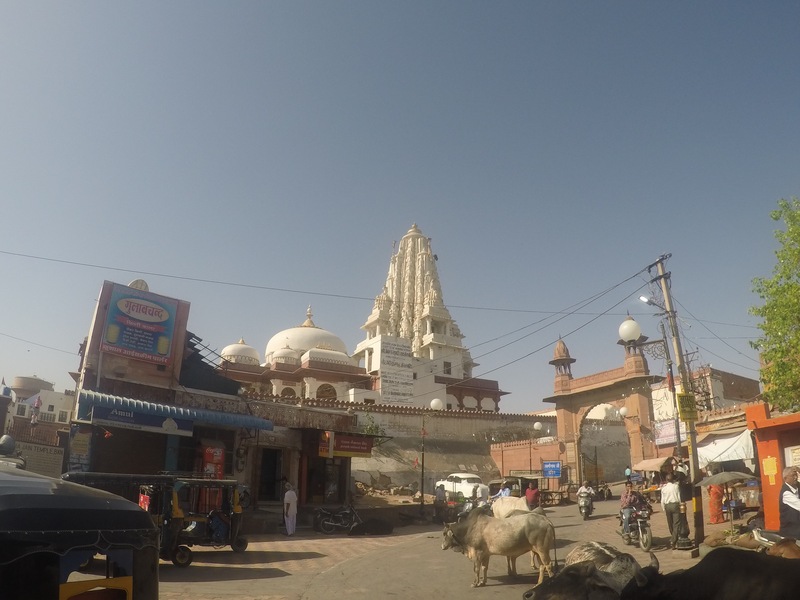 Dusty Bikaner was our gateway to the desert but once back in the car we were heading for Jaisalmer. Our long drive was made even longer as main roads were closed an diverted through incredibly rural settlements looking out on more and more sand. Trucks were the main transport on the roads moving earth for construction around the region. 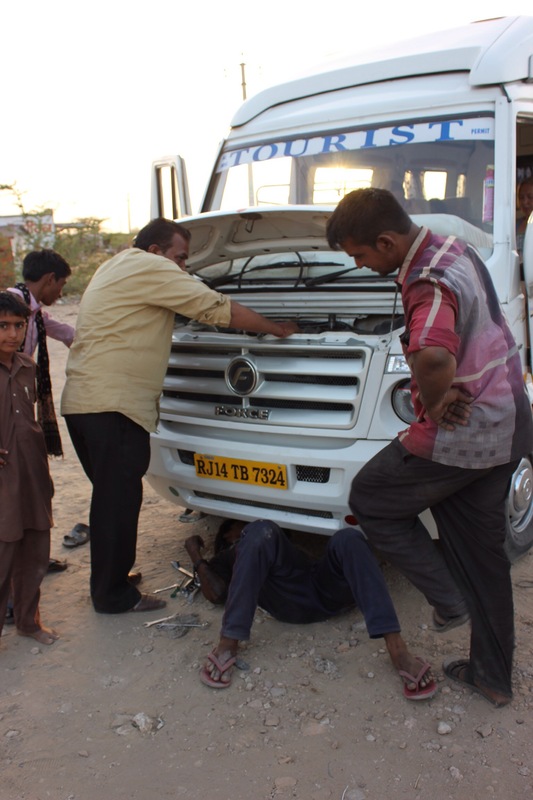 Then, running into more poor fortune, an hour from Jaisalmer a belt snapped in the engine. It was only a few short minutes before the first truck offered to help, followed shortly after by the police in a jeep. 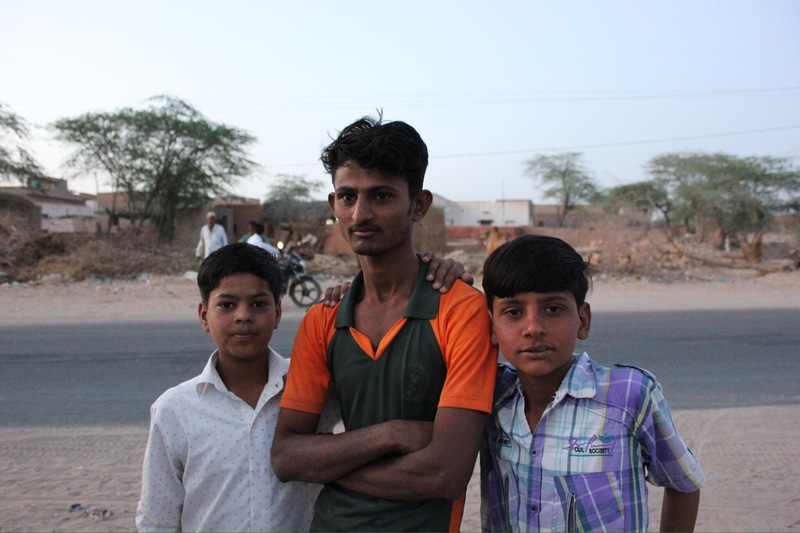 We limped a kilometre to a small village where the driver, 2 mechanics and at least 15 other men had their heads in the engine. People were stopping by to ask us questions, proposition Daisy and find out more. The settlement had brick fronted shops but mud hut housing and was incredibly basic. 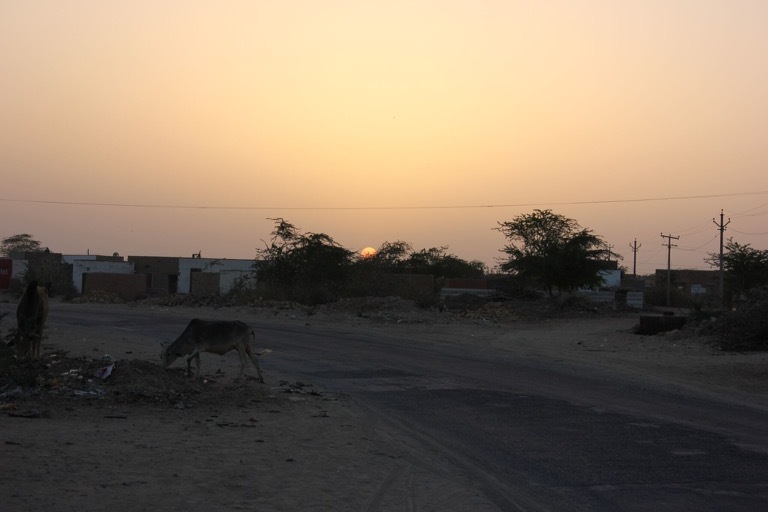 After a few hours, the sun now set and the moon rising, we made the last hour to Jaisalmer, the desert city.